Bike Box is an ecommence online retail store that is perfect for many different retail sectors. 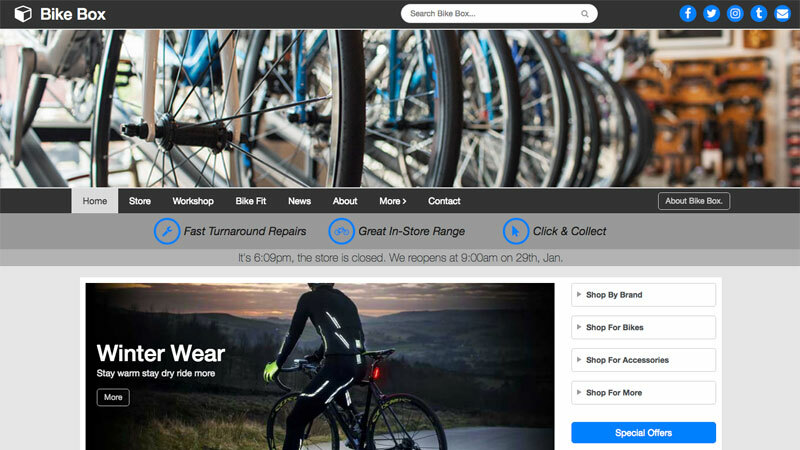 As the name suggests, we're demonstrating it here as a bike shop website. The right-hand column can be present on all but the store page, where it's replaced by the store filtering and cart. Box contains both a site wide and a store search facility. The setup and page content of the demo site is not fixed. We can build your site to suit precisely your requirements, adding, changing or removing pages as required. For further details about Box visit the demo site and click the "About Box" link.